For the first time since the Syrian civil war began, Iranian-backed militias appear to have secured a road link from the Iranian border all the way to Syria’s Mediterranean coast. The new land route will allow the Iranian regime to resupply its allies in Syria by land instead of air, which is both easier and cheaper. The road network, which starts on Iran’s border with Iraq and runs across that country and Syria, was secured last week, when pro-Iranian Shiite militias captured a final string of Iraqi villages near the border with Syria. The road link zigs and zags across the two countries, but it appears to give Iran direct, uninhibited access to Damascus and the government of Bashar al-Assad, which the Iranians have been supporting since the uprising there began, in 2011. Since then, the Iranians have been Assad’s primary backer, sending men, guns, and other material by air and sea. The news of the Iranian breakthrough comes from officials in the Kurdish Regional Government, the semiautonomous area in northern Iraq, and from an expert in Washington who has been tracking the Iranians’ progress. Kurdish officials have briefed the Trump Administration on the developments. “The corridor is done,’’ a Kurdish official told me, speaking on the condition of anonymity. “The Iranians can go from the Iranian border all the way to the Mediterranean.” Officials with the K.R.G. oppose the Iranian road. In 2012, they rebuffed an Iranian request to transit their territory to Syria. They want the Trump Administration to help block it now. “It’s an Iranian road,’’ Fabrice Balanche, a visiting fellow at the Washington Institute for Near East Policy, said. The development is potentially momentous, because, for the first time, it would bind together, by a single land route, a string of Iranian allies, including Hezbollah, in Lebanon; the Assad regime, in Syria; and the Iranian-dominated government in Iraq. Those allies form what is often referred to as the Shiite Crescent, an Iranian sphere of influence in area otherwise dominated by Sunni Muslims. The Iranians have sought to create such a sphere since the end of the Iran-Iraq War, in 1988, which they saw as a Western-backed effort to destroy their regime. That’s why Iranians helped create Hezbollah, the Shiite militia that dominates Lebanon, and trained and directed Shiite militias that attacked American soldiers during their occupation of Iraq. The Iranian push into the Arab Middle East has helped aggravate the Sunni-Shiite schism that is fracturing the region. The attack in Tehran this week by ISIS militants is emblematic of the enmity with which Sunni militants regard the Iranian regime. No Iranian trucks or other vehicles have apparently used the route yet, and no Iranian official has spoken publicly about it. A senior American official who deals with the Middle East contested the idea that the Iranian corridor was open, saying that there were still many actors on the ground who could frustrate the Iranians’ efforts to pass. 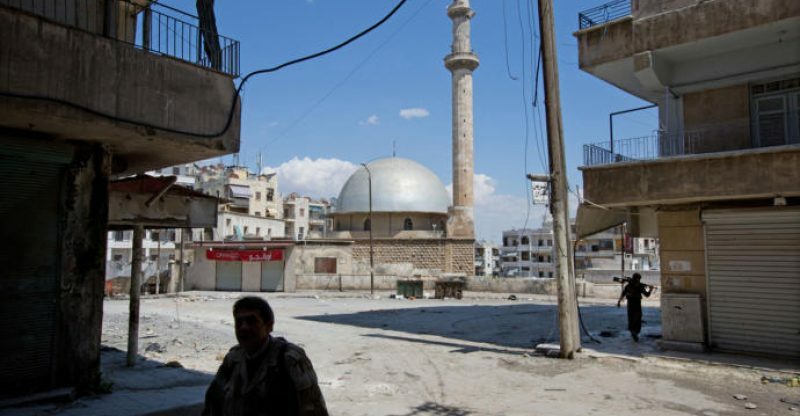 “It’s an extremely long way through Syria, and they would not control those roads,’’ the official said, of the Iranians. 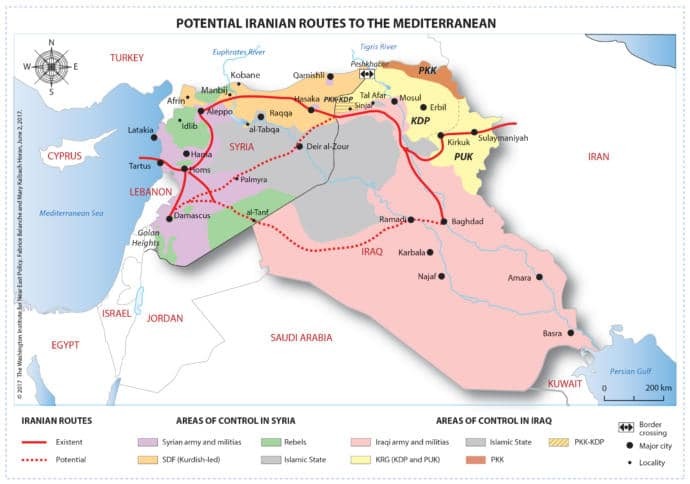 The road network makes its way across a long stretch of Iranian-friendly territory—the majority of it held by the Iraqi government, which has little leeway in opposing Iranian demands—and areas controlled by the Assad regime, in Syria. Much of the Iraqi territory that hosts the road was until recently held by the Islamic State, before it was cleared by Shiite militias, whose manpower is largely composed of Iraqis often trained and directed by Iranian operatives. 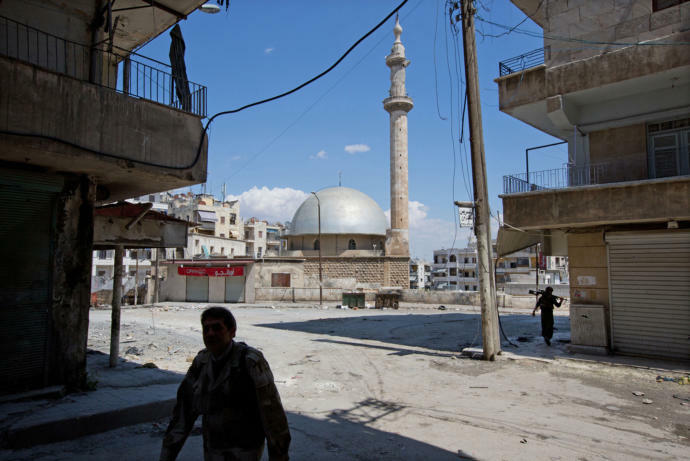 In Syria, many of the areas that make up the road network are held by Iran’s allies and proxies—including Hezbollah and Shiite militias from Iraq and Afghanistan, which have done much of the Syrian government’s fighting. The one potential obstacle to the Iran-Syria land route is the Kurds of Syria, who dominate the northeast corner of the country and who operate independently of the Kurds of Iraq. Much of the Iranian corridor runs through Syrian Kurdish territory. In recent years, the Syrian Kurds have engaged in a precarious balancing act to preserve their autonomy amid the chaos that has overwhelmed much of the rest of Syria. In practice, that has meant entering into what amounts to a nonaggression pact with the Assad government, an arrangement that has evolved at times into moments of explicit military coöperation. 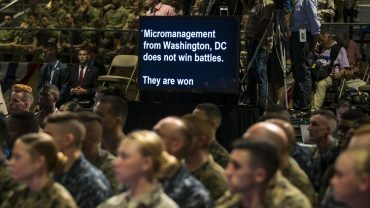 And it has also meant coöperating with American and other Western forces in the battle against the Islamic State. Like other Kurdish groups in the region, the Syrian Kurds are mindful of the fact that almost every state in the region—in particular, Turkey—is opposed to their independence. Kurdish Syrian officials say that they don’t want any Iraqi Shiite militias to cross into their territory. That’s code for not wanting any Iranians, either. Iran’s allies are already bringing pressure to bear on the Kurds to coöperate: In recent days, the Kurds have said that Russia threatened them with an attack by Turkish forces. The Iraqi Kurdish official whom I spoke with told me he believed that the Iranian corridor was inevitable, unless the United States weighs in to stop it—possibly by pressuring the Syrian Kurds. Much of the future of the Middle East will depend on who wins the tug-of-war. “Everything depends now on the Americans’ willingness to stop this,’’ the official said.